A desperate woman flees London for refuge in a quiet Scottish village. Jude Hamner has fond memories of Lowland Glen Books from a holiday she took with her husband just before he left her. Distraught after the deaths of her parents in a freak accident, she books a ticket for Scotland and arrives with only the clothes she was wearing at the funeral. Middle-aged bookseller Lowland “Lowell” Glen comforts Jude when she returns to his shop in tears. He kindly offers her refuge at his home and a job cataloging the books stuffed higgledy-piggledy all over the store. Like the owner, the house is dusty and in need of a strong hand. Slowly Jude settles into her job until a young and very pregnant Eddy Preston turns up claiming that Lowell is her father, the product of a long-ago summer when the younger, wilder Lowell hosted an ever changing group of hippies. Jude is skeptical of her claim and wonders if she’s even pregnant, so when Eddy asks for the use of the rooms Jude had cleaned and refurnished, Lowell offers Jude the use of a cottage he owns next to the church graveyard. Jude’s interest in the cottage's former owner is piqued by the often cryptic comments he wrote in the books he read before he died. Against all odds, Jude and Eddy develop a friendship, and, although she still doubts the pregnancy, Jude begins to form an alliance with the girl. A threatening note sends Jude running back to the safety of Lowell’s house, and that’s where she’s temporarily staying when someone sets fire to her cottage. 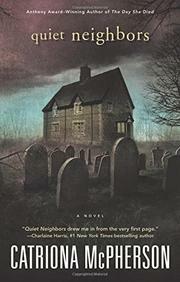 In Lowell’s home, Jude encounters layer upon layer of deception connecting Lowell’s physician father, the deaths of a number of elderly patients, a mysterious collection of photographs, and the enigma of Eddy’s birth. At the same time, she must also deal with a crisis in her life as she comes to terms with her own guilt and reveals the true reason for her flight. Although softer-edged and less terrifying than most of McPherson’s stand-alones (Come to Harm, 2015, etc. ), the slow unraveling of several deeply puzzling circumstances and the complex characters provide a fine read.